O Canada! 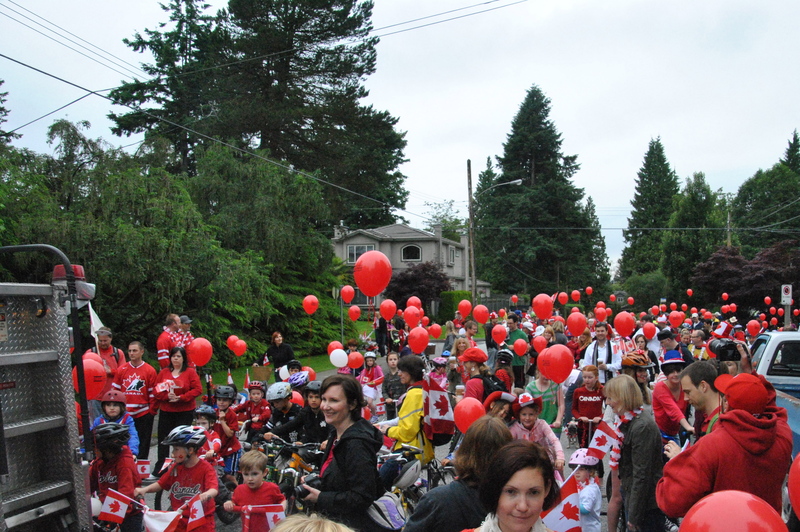 Long weekend celebration for Canada Day – 1st July 2012. Our celebration of Canada Day was not our first my husband had to remind me, but it was the most memorable! Back in 2008 when my husband and I fell in love with Vancouver while travelling, we were actually in Whistler when the celebrations took place. I was so in awe of the beauty of the place and it was the first time I had seen the mountains that I can’t recall the celebration of Canada that well. Also, what was noticeable was the large number of Australian and kiwi expats creating a racket at any opportunity to have a party up there. There are many performances and a parade that takes place here too. Canada Day is a federal statutory holiday on July 1st to celebrate the 1867 Federation when three colonies became a single country within the British Empire. 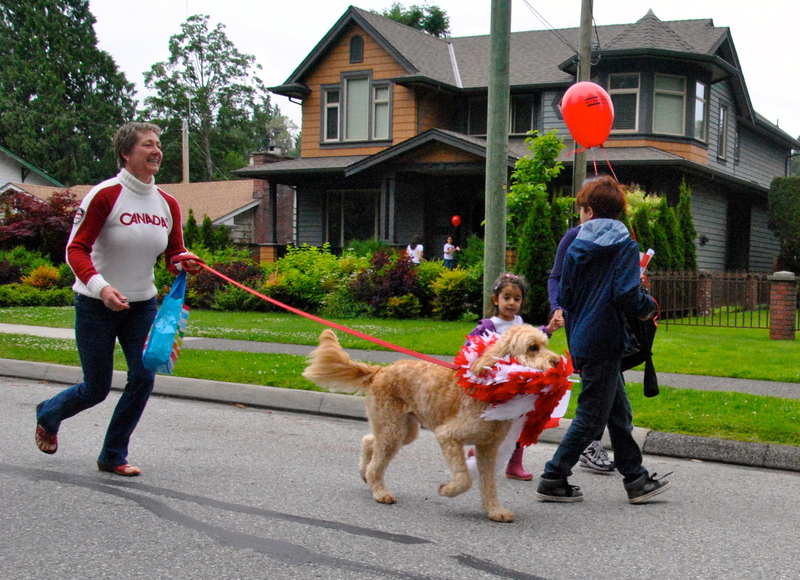 We were fortunate to be invited to some friends we have made while here (through friends from home) to their neighbourhood Canada Day parade in the Pemberton Heights area of North Vancouver in West 22nd Street. 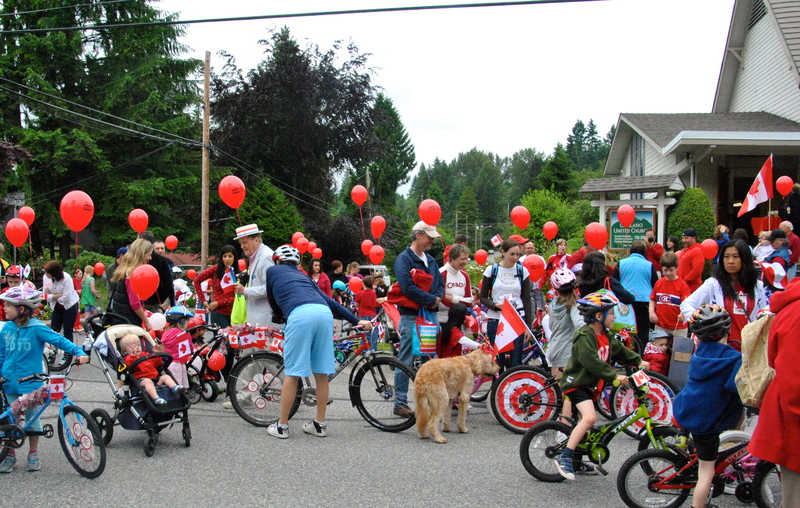 As we approached the street, there were people blowing up countless red balloons at the Capilano United Church where the “Running of the Bikes” begin. When we arrived at our friends’ home, we were welcomed with a drink and then into some bike decorating. One of the highlights of the day is the kid’s bike decorating competition and some children start adorning their bikes a week or more out from the date! I probably observed, more than I actually decorated ‘with drink in hand’ but it was fun seeing the kid’s bikes and scooters lit up in red streamers, flags and ribbons. Once we ready to scoot out the door, we made our way to the church where there was a sea of red and white flooding the road. 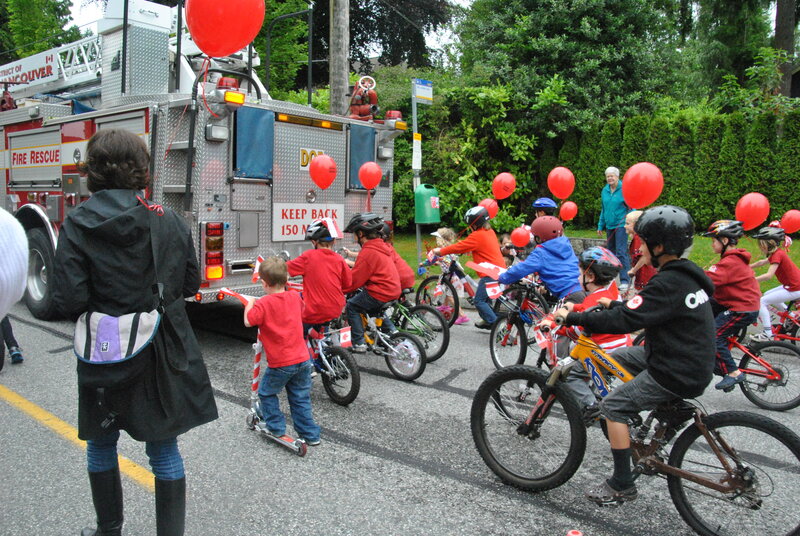 We could hear the echoing laughter and screams of excitement from the children while they were waiting on their colourful bikes for the North Vancouver Fire Truck to arrive. When the engine pulled up, the glee in their faces was evident and the firemen signalled everyone to start and away we all went…chasing the fire truck down the road at a blistering amble until we reached Sowden Park. There were two bouncy castles set up and the Fire Truck were providing endless entertainment for all. There were running races ready to commence for the older kids as well. By then it was time to turn around, feed our little ones and give them a nap to re-energize for the fun party that was about to erupt in the afternoon. ‘eh‘ has more than one meaning. Canadians often end their sentences with “eh” and it is generally considered a polite way of inviting the other listener/s to participate in the conversation as opposed to the speaker simply stating fact after fact. ‘Schwack‘ is a new word I hadn’t heard and it was used a couple of times by different people and still not exactly sure what it means except that by Urban Dictionary’s definition could be a number of things to the effect of “cool, ‘extreme pleasure’ or to take a 3 to 10 second chug of hard liquor straight from the bottle in order to get significantly drunk extremely quickly”. 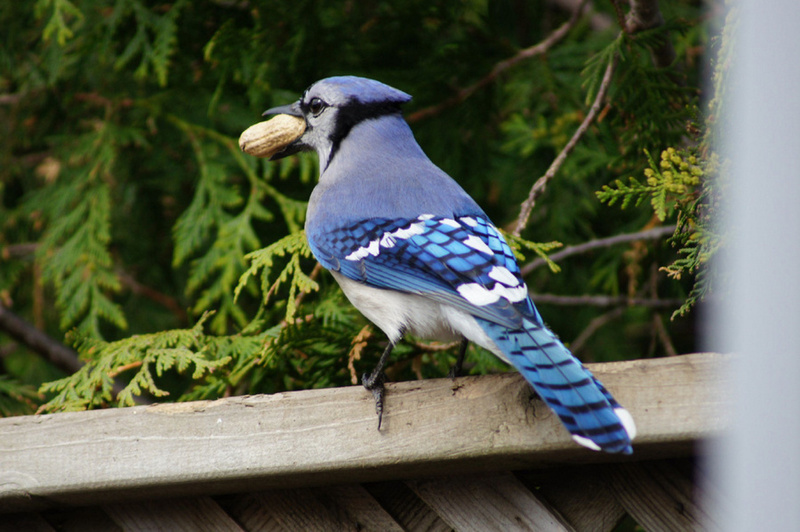 ‘A Blue Jay‘ is a native North American bird which I sighted for the first time in our friends backyard – beautiful by the way and that they are also the name of the Toronto baseball team. ‘Garbage bears‘ live near humans, scavenge for food in bins and don’t hibernate like other bears. ‘Poutine‘ really is a French Canadian dish of fries topped with gravy and cheese curds. ‘a S’more‘ is supposedly uniquely Canadian and is a traditional nighttime campfire treat which is a sandwich of Graham crackers, a roasted marshmallow and a layer of chocolate. ‘Cariboo genuine draft‘ from BC tastes quite refreshing although it is 5.5% alcohol which seems relatively high compared with most Canadian brews. ‘BC wines‘ can be very good, or at least the ones I enjoyed on Canada Day! ‘Pop‘ has a different taste in Canada (as its made from sugar), more like our fizzy drinks in Australia to ‘pop’ in the US which is made with corn syrup. ‘Canadian flag‘ has a stylish looking 11 pointed red maple leaf which bears no actual significance. 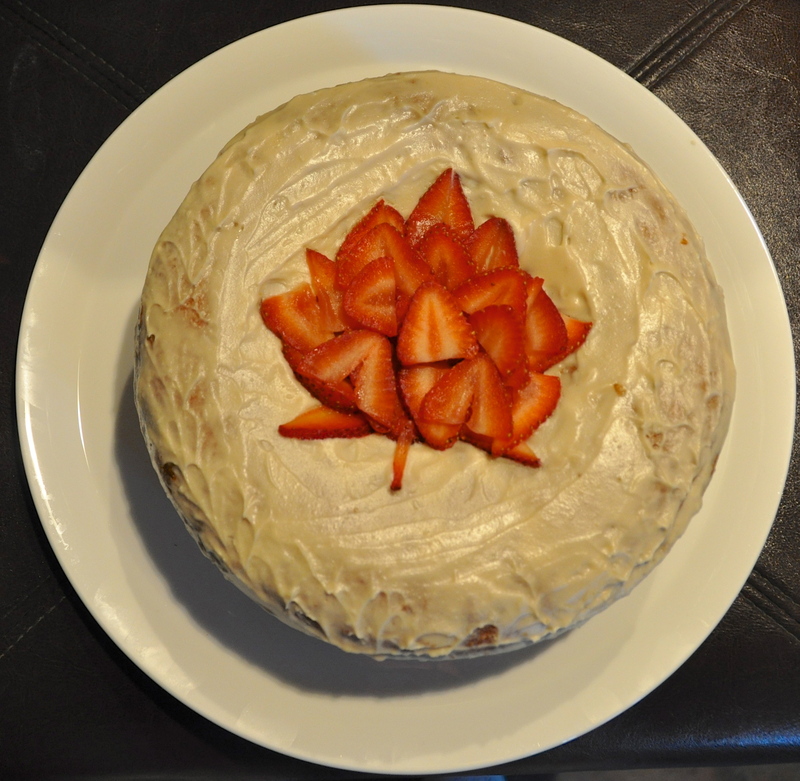 The last fact was interesting to me, because unknowingly I tried to replicate the Maple Leaf with strawberries on the maple cake I made for the day and it had only 10 visible points so had I have included one more it may have improved the stylised look of my baking efforts. For those recipe hunters, I am happy to post up the Maple Cake ingredients and method too, just let me know! All in all, it was a day that we will treasure to have spent with a lovely group of Canadians and thank our friends for inviting us to be involved in the true Canadian spirit.